Breathable boxing & MMA hand wraps.Hi-Tech Performance.1 Year Warranty!! Extra soft fabric adult hand wraps. Attractive hawk boxing woven labels. Ideal knuckle positioning for knuckle protection. Fast dry hand wraps for men and women handwraps. Thumb loop feature for ease and convenience. Semi-Elastic Made of Cotton & Nylon. Extra-long 180'' wrist wrap to prevent wrist injuries. Machine washable kickboxing hand wraps. Hook & Loop with Velcro Closure wrist wraps. 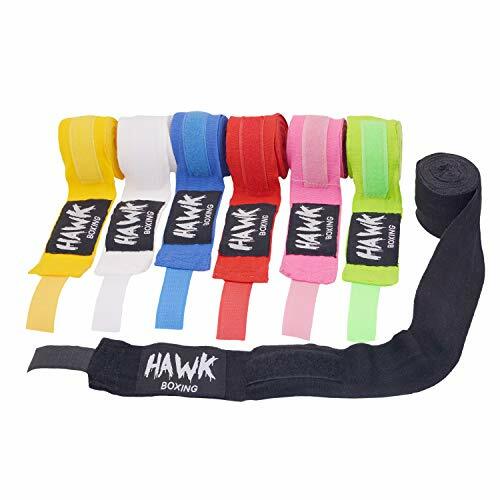 MAXIMUM QUALITY at a MINIMUM PRICE: This a bargain, we bet that you would not be able to find such high quality handwraps for boxing gloves at this price in the market.